No visit to the Florida Keys was complete without stopping at THEATRE OF THE SEA. Billed as "The World's Second Oldest Marine Life Park", this attraction opened to the public in the late 40's on Windley Key at Islamorada. Unlike other marine attractions where you observed dolphins and sea life in steel-and-concrete tanks, the finny residents of THEATRE OF THE SEA lived together in a huge, outdoor lagoon. That lagoon was created in the 1930's when Henry Flagler built "The Railroad That Went To Sea". The trestles to support the tracks on its way to Key West were built on pilings made of limestone rock quarried from Windley Key. Over the years, the quarry became filled with seawater so an enterprising entrepreneur decided to stock it with dolphins, sharks, sea turtles and other species of marine life for the public to enjoy. Back in the 'Golden Days' of Florida tourism, attractions had a gimmick. While Silver Springs in Ocala had their "World Famous Glass Bottom Boats", THEATRE OF THE SEA had "The Bottomless Boat". This was a pontoon boat with a hole in its hull where you could observe the marine life through the clear water. The dolphins would leap alongside the boat and come up inside the hull to greet you. Gimmicks like that tickle this writer! 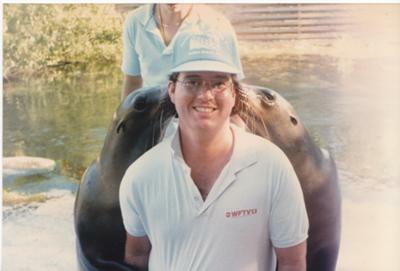 My first visit to THEATRE OF THE SEA took place in 1976 while I was working for Sea World. My co-worker, marine biologist JIM MAYER and I were on our way to Marathon to pick up a shark from Gerry and Mary Lou Klay of SharkQuarium. Since neither of us had ever been to this Florida Keys attraction, we decided to stop and have a look. The park personnel welcomed us and gave us a most interesting tour of this unique marine attraction. The highlight of my visit was when I received a kiss from their sea lions, 'Phelps' and 'Kelpie'. The audience screamed with delight when 'Kelpie' swam through the water with her flipper sticking out imitating a shark fin while the theme music of "Jaws" was played! I saw this behavior repeated years later at Sea World . . . I smiled knowing that another trainer had conditioned it. THEATRE OF THE SEA is still entertaining and educating tourists to the Florida Keys, and today you can actually swim with their dolphins. It gives this writer of nostalgia a warm feeling to know that a long-time Florida attraction like this is still around.